Many retailers continue to experiment with in-store design by engaging customers in new ways on featured products. One of the latest companies to step into this realm is Timberland, which recently presented its Tree Lab concept at its King of Prussia store in Pennsylvania. Timberland’s approach to ramping up its brick-and-mortar customer experience features different themes like “Streetology” and “SHEvolution,” that are scheduled to change every six weeks. Similar to the experiential design of Nike’s Soho flagship store, Timberland’s gallery-like settings will offer customers a new take on the brand — styles, technology, and real-life applications. Timberland hopes the alternating themes will draw attention to a variety of customers at different times throughout the year. 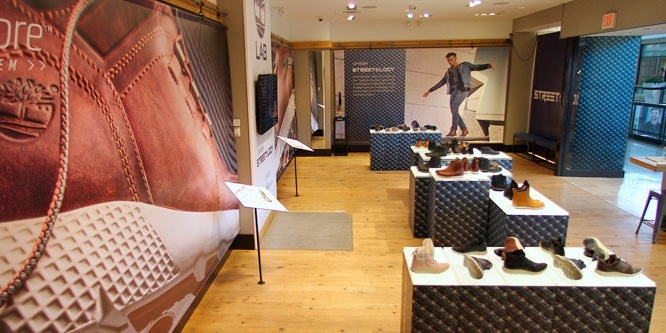 However, Timberland reports its Tree Lab concept is not its only in-store test in the works. A challenge that retailers like Timberland and Nike face when experimenting in this area is making the high amount of resources invested in their experiments pay off in both brand awareness and bottom line. Limited ROI may prove to be a factor in the case of Timberland, in particular, with the operational costs of periodic alternating of in-store themes posing a challenge. As with any new experiment, ROI is likely to determine whether Timberland’s early treads into experiential retail will make the cut to expand to other Timberland stores. Read more here.